Buddy-boating with my brother's powerboat caused me some anxiety. My foremost worry was that my crew (my kids) would decide they prefered power boating, mutiny, and be reluctant to come sailing in the future. Before the trip, one of my astute offspring commented, "Dad, how come you like slow stuff? Sailing is slower than speedboats, hiking is slower than owning a 4 wheeler, and camping just seems slower than staying in hotels." But I was pleasantly surprised in the end. 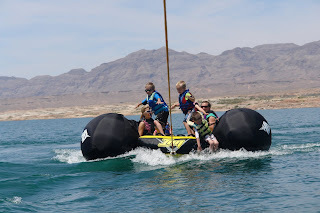 The kids absolutely loved knee boarding, riding the tube, and wakeboarding. But on the last day as we sailed 2 hours back to the marina, they all decided they preferred owning a sailboat to a powerboat. But they were also quick to point out that we needed to go out on a powerboat a couple times a year just because it was really, really fun. Personally, I prefer sailing for a couple reasons. 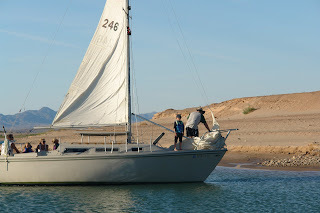 When our family sails, everyone can participate. My 14 year old mans the jib sheets for tacking and is learning to operate the outboard for negotiating our marina. My 12 year old takes all duties forward the mast. He raises the jib, rigs the whisker pole, stows the foresail, and during docking is the first one on and off the boat to retrieve docking lines. My 10 year old has proclaimed herself 'Winch Wench' - the person responsible for raising and lowering the swing keel. We must raise the keel going in and out of the slip, and she will frequently jump below during a trip to tinker with the keel winch in order to quiet the cable hum. The 6 and 8 year olds are the Fender Men - and there are no fenders in the world deployed with a greater air of sophistication and advanced seamanship than are our fenders by those two fine mariners. And my 3 year old is responsible for dishing out the ginger snaps and drinks to the entire crew whenever she feels nourishment is needed. I also enjoy sailing because it so completely occupies one's mind as to leave to room for thoughts about work, daily stresses, or anything but wind, canvas, and family. My brother on the other hand prefers the excitement of speed. So everyone has a great time as you can clearly see from the pictures! The kids really enjoyed being towed around in two shifts. The older kid shift involved a very fast boat trying to flip as many kids into the water at once as possible. 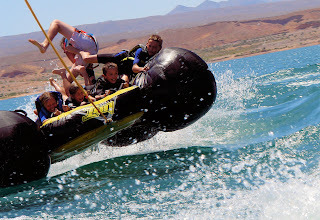 The younger kids risked life and limb by surfing on the tube at a breakneck pace of 5 miles an hour. Thrill seekers.